Sleek and magnificently presented in a sturdy, gloss white gift box. Everything about this pack accentuates quality and promises that you are about to experience something truly exceptional. Its fully personalised with their name and your own special message. It will be sent in plain packaging so there is no chance the surprise will be ruined. 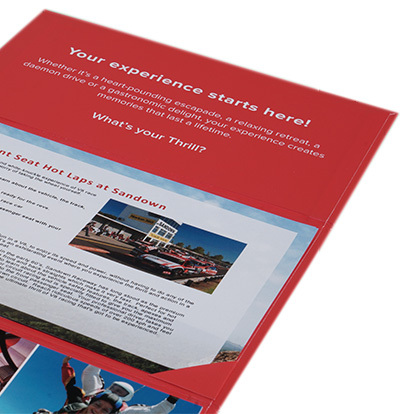 The folder is a full-colour, slim A5 pack. 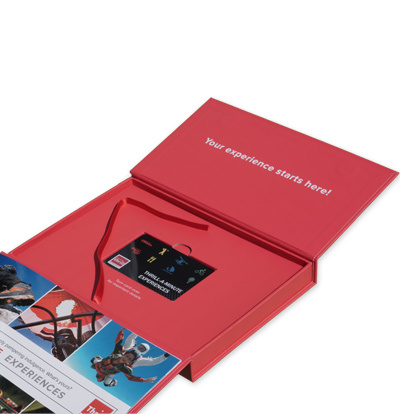 It includes a card with personalised message, plus all the details about the experience. Like a credit card, the voucher is PVC and easy to carry around. Not only does it look great, it's also fully personalised with their name on. 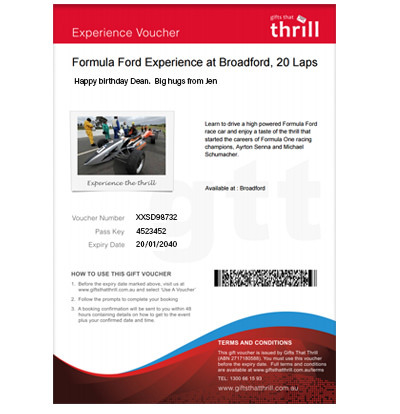 The emailed e-voucher is ideal if you are concerned the gift pack will not arrive in time or if you simply wish to receive your gift details without having to wait for the post to arrive. Your Shopping Basket lives to thrill. Give it purpose. Fill it with experiences and lots of fun. There are many great experiences to choose from; continue shopping and thrill you will. Couldn't be happier with the service and Thrill Experiences offered the best price and gift box.